mdadm is a Linux utility used to manage and monitor software RAID devices. R-Linux supports such devices and when drives from a mdadm RAID are connected to a Linux computer, it automatically detects them and assembles mdadm RAIDs accordingly. R-Linux detects components from mdadm RAIDs and creates those RAIDs automatically. At the same time, R-Linux gives access to the components of those RAIDs (hard drives and images). 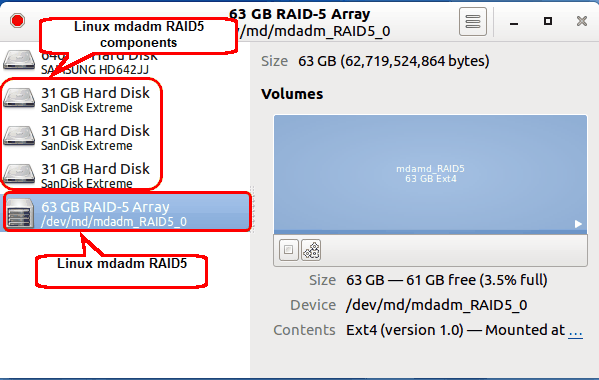 When an automatically created mdadm RAID is selected, R-Linux highlights its components. It also highlights the mdadm RAID that Linux may itself create from the same components. R-Linux shows broken mdadm RAIDs in pink.